The authors began with 498 press releases but only 41 of those also provided a matching scientific paper AND a news release. Of the 41 scientific papers, 17 (41%) of the abstract conclusions contained spin and 24 (59%) did not. (Figure 2 [below] of the paper shows the results). Of the 17 that contained spin, 16 out of 17 of the resulting press releases (94%) and 17 out of 17 (100%) news stories also contained spin. 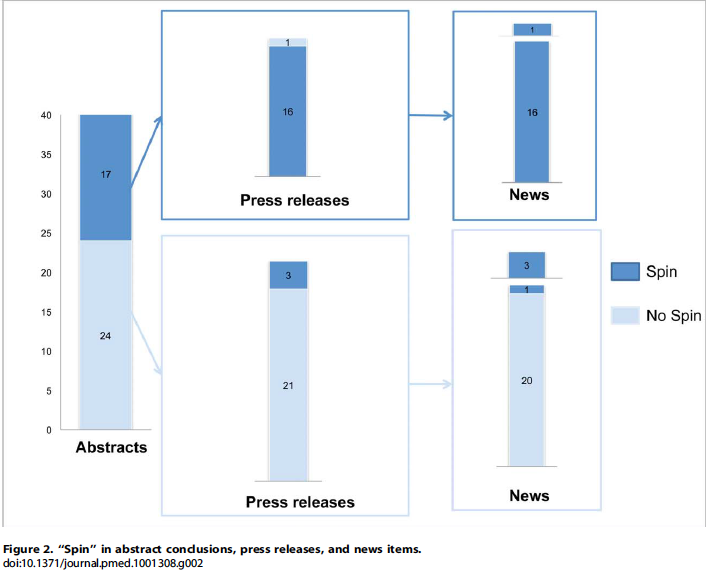 On the other hand, of the 24 scientific abstracts that did not contain spin, only 3 (13%) of the press releases contained spin and 4 (17%) of the news stories. The authors pointed out that their own study had limitations, including only examining 41 studies (that had both a press release and news story associated with them) chosen from one media outlet over a four-month period. The method used also did not show whether the type of spin in the scientific abstract was the same as that reported in the press release and news story. The study in PLOS Medicine found that the source of funding (for-profit versus public) did not affect the level of “spin”. This is an interesting finding given the public’s confusion over the funding of science as mentioned in the Science MoJo article, “Is trust in scientists based on a misunderstanding?”. The study found that specialist journals are more likely to publish scientific articles containing “spin”. Given their results, the authors point out that reviewers and editors of peer-reviewed journals have an important role to play in accurately communicating science and medical findings to the public when they assess submitted articles. While journalists tend to cop the blame for inaccurate reporting of results, this study suggests that the overstating of benefits in the news media is related to “spin” in scientific abstracts. It seems a no-brainer that scientists should be careful that they are not overstating their results. The authors label the overstating of benefits by scientists as “intentional or unintentional”. Certainly in that past, I believe that the pressure to condense a technical subject into a pithy “elevator pitch” might have caused some scientists to unintentionally overstate benefits. The idea that the “spin” is intentional is disturbing given that accuracy in reporting should be an essential skill of scientists. Scientists should be trained to understand how the news media operates and ensure accuracy in their own writing. This will help to minimise downstream “spin” as PR departments grasp at exciting findings to improve funding opportunities for their institutions and journalists look for an interesting angle to inform their readers. I’m also looking forward to reading “The Best Science Writing Online 2012”.